Here's a shocker: employees who worked on this game really love this game. 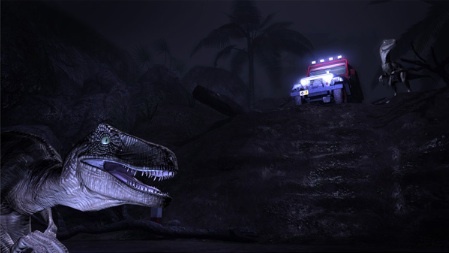 Reviews for Jurassic Park: The Game have slowly trickled in (we'll have one next week). The verdict? Awful. Most websites slammed developer Telltale for performance issues and excessive Quick Time Events. I can haz purrrfect ten? Sad to hear about the stuttering frame rate, especially when producer Kevin Boyle said the game runs remarkably well on the iPad 2. You can read the interview here. That aside, what really surprised us is the recent news that Telltale employees intentionally abused the user reviews section of Metacritic by publishing perfect ten out of ten reviews of the game. Gamespot did a little digging on what it deemed potentially bogus posts, only to discover that the users left a trail of breadcrumbs back to Telltale. One is a user interface artist, the other a cinematic artist. What a shame. While one could make the argument that reviewing his or her own game is akin to voting for themselves in an election, we feel exactly the opposite. Such a high score definitely tricks some consumers into making a purchase, only to discover the game's (potentially) disastrous. Telltale responded by saying it doesn't "muzzle its employees", and that it's their responsibility to clearly state which company they work for. Sounds a bit strange to us. It's one thing to do interviews enthusiastically pushing your game. Giving it a 10/10 to boost an average, though, seems wrong.